What are the benefits of coffee? Is it a healthy drink - or is it one to avoid if you want to live a natural, healthy life? Drinking coffee may be more beneficial than we think. But there are some environmental questions, too. 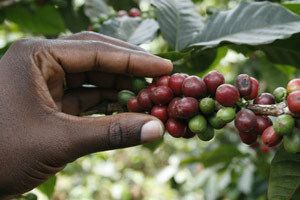 How does coffee figure as part of the world economy? Are the coffee benefits we may experience just at someone else's expense? Just how sustainable and eco-friendly is drinking coffee? This page looks at the benefits of coffee drinking both for ourselves and for a green and caring world. Coffee drinking has come along way since the first European coffee shops popped up in the 16th century. Not a lot is known about its use in early cultures. It seems likely that the Sufis (a mystic sect of Islam) may have popularised its use in their ecstatic religious trances. It was almost certainly a plant native to Ethiopia rather than South America. Now coffee culture has spread: coffee is drunk right around the world and is absolutely standard in hotels and bars almost everywhere. The benefits of coffee for health are also now becoming apparent. Coffee was used as part of religious ceremonies in some parts of the world. It also has played a part in some radical political groups. The first coffee shop in the world is thought to have opened in Constantinople, Turkey in the 15th century. Certainly the Muslim world was addicted to coffee before Christians; coffee houses were popular in Damascus and Mecca by the 16th century. Coffee drinking probably became more widely popular in the Christian world once the Catholic church ceased to regard it as the devil's own brew. "it stinks...most loathsomely. The propugners (sic) of this filthy drink affirm it causes watchfulness...they also say it makes them sober when they are drunk." Unfortunately the idea that it can make you sober when drunk is largely wishful thinking. There are two main types of coffee commonly grown and used to prepare commercial coffee blend: arabica and robusta. Arabica is generally regarded as producing the better, more flavoursome berry. Robusta berries are often used to produce cheap, instant coffees but they also have a role in some of the better coffees, imparting more body and depth of flavour. Different areas produce different flavours, too and many of the big coffee producers use this fact to produce subtle and attractive blends for different purposes. This means that coffee is often imported from around the world before being blended and shipped out, making its carbon footprint considerable. With up to 100 million people dependent upon growing coffee plants for a living, coffee is a vital crop. Coffee plantations are present in dozens of countries around the world. But there are environmental concerns. In Indonesia coffee is grown illegally on land cleared for the purpose. Some of this coffee finds its way into the supply of some of the biggest western players in the instant coffee markets. Coffee is best suited to growing in tropical latitudes, between the Tropic of Cancer and the Tropic of Capricorn. For this reason it is often one of the many factors behind rainforest destruction. Many of the best coffee companies are now beginning to address some of the environmental concerns. Fair Trade coffee companies are leading the way. Please see Organic coffee information for more about coffee growing and the environment. The immediate benefits of coffee are strikingly obvious. It provides a lift - of energy and mood, making you wakeful when you are drowsy and hyper-alert when you are already awake and ready for action. Much of the western world now apparently runs on this fuel; from businessmen and women to models of haute couture, people are drinking coffee to get themselves up to speed for today's hectic lifestyles. The benefits include resistance to type 2 diabetes, Parkinson's Disease and mood enhancement. Asthma sufferers may experience some relief from symptoms and the caffeine in coffee even works to some extent in pain relief! More on some of these benefits in a moment. First, here's a brief look at some of the not-so-beneficial effects of drinking coffee. Common negative effects of coffee drinking include hyper-wakefulness, inability to relax or sleep and jitteriness. Coffee can also cause an accelerated heart rate and even cause elevated blood pressure. Most of these effects can be avoided in otherwise healthy individuals by reasonable moderation in the type and strength of coffee drunk. More serious effects include a tendency towards heart arrhythmias. There was a suspicion of this for many years (after all, we all know strong coffee can make your heart race) but such health effects of coffee were discounted by many studies. Recent studies, have shown that coffee can indeed produce heart arrhythmias which could lead to an increased likelihood of suffering a stoke in some people. The people who are most at risk are those who neglect to eat enough fresh fruit and veg. The "Mediterranean diet" is thought to offer a level of protection from this kind of effect from coffee drinking. People on the "standard" western dietmay be more at risk because of the higher levels of saturated fats and cholesterol-laden foods and because of a lack of vitamins and antioxidants. Many studies have indicated that diabetes can be found far less in regular coffee drinkers. And the more coffee you drink, the more you are likely to remain protected against this insidious modern disease. Type 2 diabetes (also called adult on-set diabetes) is increasingly common in modern, western peoples, mainly because of the junk-food diet coupled with lack of regular exercise. Diabetes is presenting health organisations and authorities with a massive problem. The NHS in Britain spends more on this one disease year on year and more and more young people are succumbing to it. It is not only costly - it shortens lives. A recent study conducted by Harvard University added to the weight of evidence in favour of coffee drinking as a preventative against diabetes. It seems that even as many as six cups of coffee a day have a preventative benefit. the report does not say whether this is because the coffee users are so wound up that they exercise constantly! There are certainly some studies which suggest that coffee may aid athletes in the search for endurance and stamina. It is not yet known why coffee has such beneficial effects. One theory is that it is linked to the large number of antioxidants present in coffee. Parkinson's Disease is a frightening and debilitating illness of mainly older people. Coffee drinking can provide some protection. Italian studies have shown that coffee drinking may even help prevent dental cavities. They have found anti-bacterial properties in coffee and also some agents in coffee which may prevent food sticking to teeth. Coffee has also been shown to have benefits in protecting people against colon cancer and it has a marked effect upon the incidence of liver cirrhosis and gallstones. All this would tend to suggest that it has a tonic effect upon the digestive tract. Herbalists regard it as a stimulant and anti-narcotic. It has long held a reputation for helping with hangovers and that "morning-after-the-night-before" feeling. If you are already a coffee lover you will find plenty of justification in the above benefits of coffee. If you want to stay green, as well as healthy buy the best quality coffee you can afford and drink it in moderation as part of a healthy, wholesome diet. Use the Fair Trade logo brands as far as possible as they are far better for the coffee producers and far more likely to be green and ethical in their trading and packaging. And of course, buy organic coffee for the best coffee benefits for yourself and the planet. Heart patients and pregnant women are generally advised against taking coffee. For the rest of us, the benefits of coffee are mainly found in moderation.